It’s quite simple to use. Look up the POWER in Watts in the first column, then read across for how much that device will cost you every minute, hour, 4-hours, all day etc. 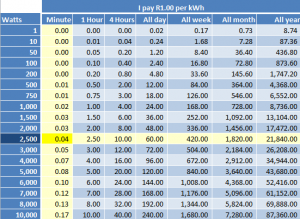 There’s two separate sheets, one for if you pay around R1.00 per kWh, and one if you pay closer to R1.50 per unit. As an example, I found in the last article (http://blog.homebug.co.za/?p=217) that my kettle uses 2400W – that’s pretty close to 2500. So read down the cheat sheet until you get to 2500W. Then if I read across, I can see that the kettle being on for 1 MINUTE costs me R0.04. Make sense? So if you’re kettle is on for 2 minutes, it probably costs you R0.08 to boil the water. On another end of the scale and trying the second sheet (for people who pay R1.50 per kwh) – old style light bulbs can be 100W. Leaving one of these on for a whole month will cost R109.20. Whereas if I replace that with a CFL or LED light that only uses 10W, it will only cost R10.92. So if I leave that light on for 24-hours every day, replacing an old 100W bulb with a 10W bulb will save me almost R100 every month. That is a little unrealistic, I know, so let’s say I only have it on for 4 hours every day, I can also use this sheet — just look up 4 hours rather than 1 month. Here we can see that a 100W bulb costs R0.60 every day, whereas a 10W bulb only costs R0.06. So you’d save R0.54 every day. Over a month that would be R16, or over a year almost R200. You can see why everyone is so keen to replace your light-bulbs now!